Clicking on the screen shots will expand them to full size. 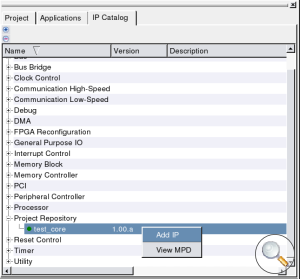 This HowTo introduces creating a custom peripheral for use in EDK projects. The peripheral is created using an EDK wizard. 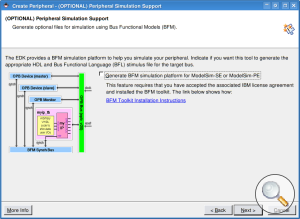 If you want to try manually creating a peripheral, see the Direct OPB interfacing HowTo. 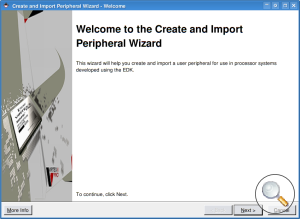 The Create and Import Peripheral Wizard provides a simple way of setting up an interface between your custom peripheral logic and the microprocessor. The procedure outlined in the next section will create a custom peripheral called test_core that connects to the system's OPB bus via an IPIF block. The left-hand diagrams above show the final connectivity (note that other blocks have been removed for clarity). The test_core is connected to the PPC microprocessor via two buses, the PLB (orange) and the OPB (green). The right hand image shows the construction of the test_core custom peripheral (green). 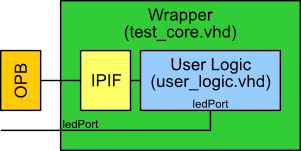 The peripheral contains two main parts, the IPIF and User Logic. The IP Interface (IPIF) (yellow) is used to glue your logic (blue) to the bus (orange). Essentially, the wizard is used to create the test_core wrapper and to insert and customise the IPIF section. It is then up to you to fill in the User Logic section. The document opb_ipif_arch.pdf, found within the EDK installation's doc folder, provides more information on the the OPB based IPIF architecture. The project from Simple Project HowTo is used as the starting point for this HowTo. 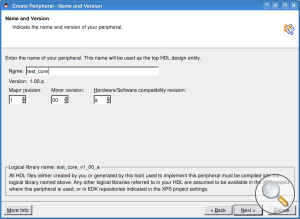 Select Create templates for a new peripheral. You have the option to add your new peripheral to a global repository, or to store it within the project. Select this latter option. Once you developed your peripheral you can easily copy it to a more globally available location. Give your new peripheral a name. For this HowTo, we'll use test_core. Note that the name is unfortunately limited to all lowercase letters. The prime goal of PLB is to provide a high-bandwidth, low-latency connection between bus agents that are the main producers and consumers of the bus transaction traffic. 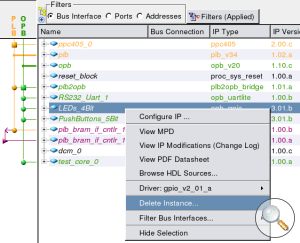 The prime goal of OPB is to provide for a flexible connection path to peripherals and memory of various bus widths and transaction timing requirements while providing minimal performance impact to the PLB bus. Note: If you are intending to use your peripheral with the MicroBlaze processor, you're better off choosing the OPB. S/W reset and MIR - Software controlled reset and Module Information Register. A special memory location will be created, when written to it causes the reset signal to be asserted. User logic S/W register support - Software accessible registers. Next, you must select the number and width of the registers. Choose 4 32 bit wide registers. This section provides the opportunity to include bus signals other than those required by your settings so far. Just click next. The final page gives you a summary of your peripherals settings. You have now created the basic outline of your custom peripheral. Go on to the next section to find out how to complete the peripheral. This section will describe how to create a simple peripheral that connects to some external LEDs. As described in the previous section the Create and Import Peripheral Wizard only creates a wrapper which needs filling with your design. The main file that need attention is the user_logic.vhd file. The file structure shown below shows where this file can be found. Open the user_logic.vhd file. You will see that the wizard will have created a template. It contains 4 registers that can be written to and read from. Below is a link to a tidied up and a more readable version. Download it, have a read through and replace the old version. This version does essentially the same thing, but with a few tweaks. Firstly, the direction of the data bus is changed. The OPB uses (0 to 31) std_logic vectors. This is the opposite to everything I'm used to (and most other VHDL designs), so I've put in a function to reverse it. I've also added in a connection between register 0 and an external LED port. 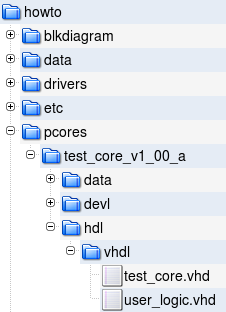 As described in the introduction the user_logic.vhdl is surrounded by a wrapper (for this peripheral this will have been created as test_core.vhd). Because we've added some extra signals (ledPort) coming out of our user_logic block, these need to be connected through and out of the wrapper. The diagram below illustrates how the ledPort signals need to be added to the wrapper. Use the link below to download the modified test_core.vhd file. Look at the differences and then replace the old version with the new one. 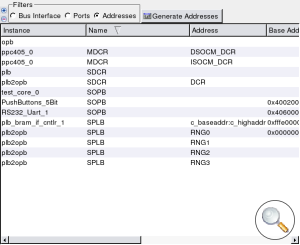 The wrapper VHDL file is clearly marked with the locations where additional signals and generics can be added if necessary. You need to make the EDK tools aware that we've added some signals (the LED Port) that we want to connect externally to the FPGA. This is done in the MPD (Microprocessor Peripheral Description) file. Note: The version number after the MPD filename (v2_1_0) does NOT reflect the version of the peripheral. It is the version of the MPD file format. 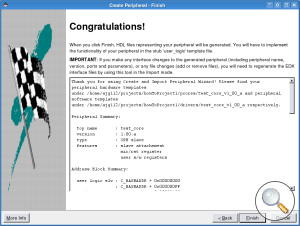 You can download the completed test_core using the link below. The final stage is to add the peripheral to your project. First, make XPS rescan the available peripherals. Select Project->Rescan User Repositories. 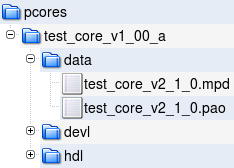 To add the new peripheral, find test_core under Project Repository, or Project Local pcores. Right click and select Add IP. To connect the new peripheral to the bus, first expand the test_core instance, then click the empty green circle so that it turns filled. This shows the IP is connected. Select 'Addresses' in the Filters section. Then click the Generate Addresses button. This will memory map the new peripheral into the processor's memory space. Now we shall connect the LEDs to an external port. 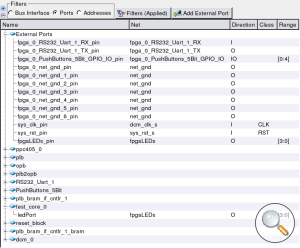 Select Ports in the Filters section. Expand External Ports. This will already contain a bunch of external signals. Select Add External Port. 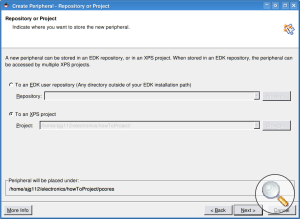 Change the new port from ExternalPort_0 to fpgaLEDs_pins. In the next column along, add a new net name, fpgaLEDs. Set the direction to O for output. Change the range to [3:0] to reflect that this is a 4 bit bus. Finally expand the test_core and select the Net as fpgaLEDs. If you used the system from the Simple Project HowTo you will already have a GPIO peripheral connected to the LEDs. We will need to remove this peripheral as we can't have two peripherals driving the LEDs. You will be prompted to choose what to do with the ports associated with the peripheral. 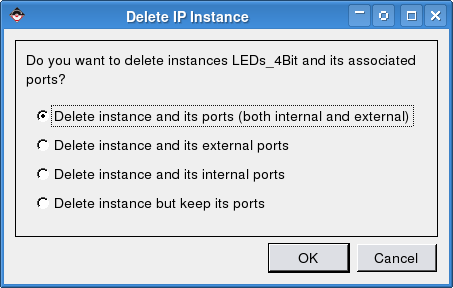 Choose to remove both the internal and external ports. The last stage is to edit the system's UCF (User Constraints File) and make sure that the new ledPort signals are actually connected to the FPGA pins that are routed to the LEDs. 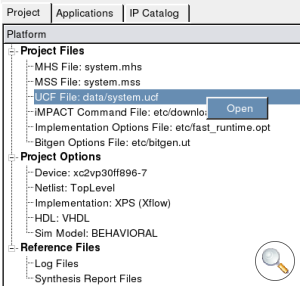 First open the system's UCF file. Once opened look for the constraints for the old GPIO peripheral (shown below), these all need removing. Finally, set the constraints for the new peripheral. An altered system.ucf file can be downloaded using the link below. The last stage is to write some code to make use of the new peripheral. Below is a c file that will make the LEDs count up. Note: The LEDs will show the count value in inverse, this is because on the XUP-V2Pro board the LEDs are wired active low. Create a project and add this file as the source file. See the Simple Project HowTo if you don't know how to do this.